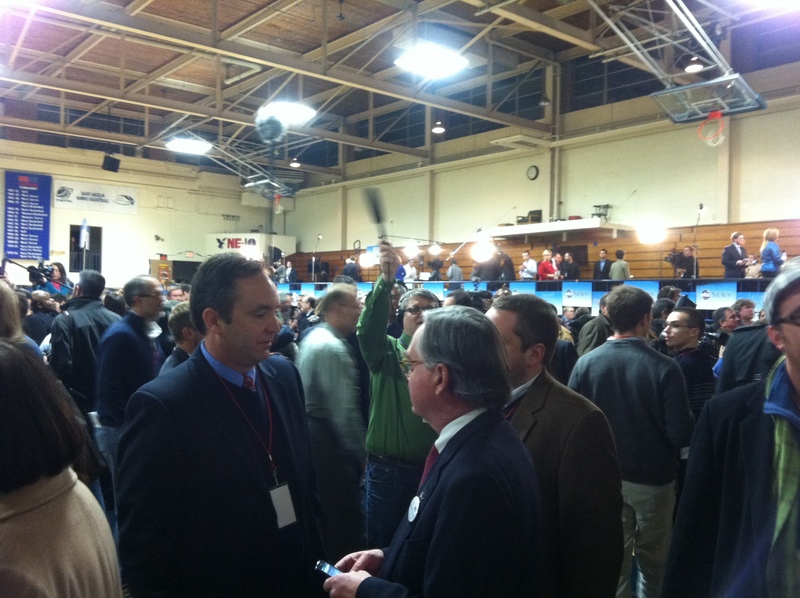 Reporting from New Hampshire | Terri Ogan. Communications Specialist. Right now I’m sitting in my hotel room in Concord, NH, decompressing from covering the ABC/WMUR Republican debate for the 2012 New Hampshire Primary. After a whirlwind night, where I sat amongst my classmates and hundreds of media outlets, it’s time to find the next story. I’m with 11 other Emerson College students reporting on behalf of WEBN-TV, one of Emerson’s news stations. Crazy, right? This isn’t some insignificant event I’m covering for class. This is history in the making with some of the nation’s top media outlets flocking to events and digging for stories in New Hampshire. This is a taste of reality and boy does it taste good! 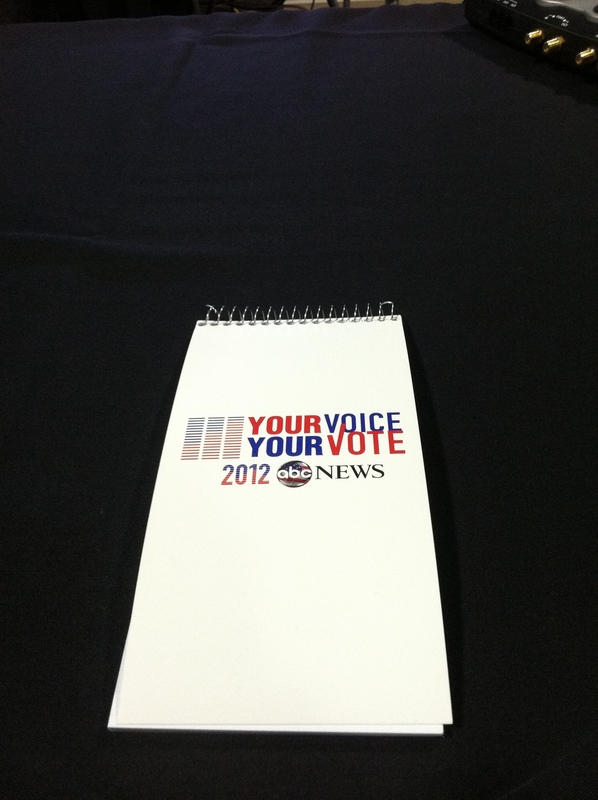 Last night around 7:30 p.m. we arrived at St. Anselm’s College to set up for the ABC/WMUR debate. We got our press credentials earlier on in the day and entered the room with poise and grace (although I really had to channel my energy to keep it together because I was a bit over excited). There were hundreds of media outlets assigned to different tables in front of two large projection screens and scattered HD TVs. We were provided with reporter’s notebooks and power outlets for our gear (I only had my laptop, SD audio recorder and camera). There was also a table of food, coffee and other beverages for us to dig into when we wanted. The energy in the room was intoxicating. Reporters from all over the world concentrated on the event, fixing any last-minute technological glitches and tweeted their little hearts out. I opened my computer, logged onto Twitter, started up my audio recorder, and joined the social media conversation on what the Republican candidates had to say. When the debate came to an end we packed up our stuff and headed across the way to what is called the “Spin Room.” This is where the candidate’s reps answer any and every question the media has to ask. This was bonkers. The reporters, or hawks, should I say, barraged the reps to get those few great soundbites or action photos. I became more and more thrilled as each second went be. Could this be my potential career? How lucky am I? Once we wrapped up in the “Spin Room” we went back to the hotel where I started my first real deadline piece. I finished at 2:30 a.m., sent my article to my executive producer and closed my lap top. With adrenaline streaming through my veins I laid in bed recalling the intense experience. Shortly after I closed my computer, I received an email saying my article was live.